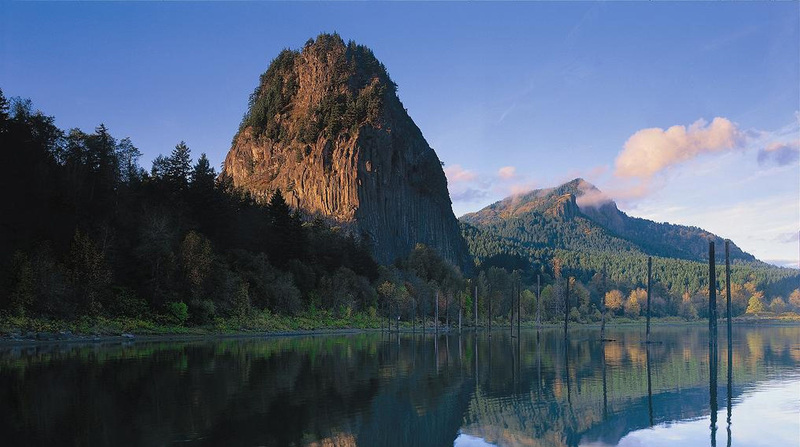 Beacon Rock is a well known landmark that is recommended for first time visitors to the Gorge. Beacon Rock is the core of an extinct volcano. Henry J. Biddle, an early owner of the rock, finished the original trail in 1918. The plug is 848 feet high with handrails lining most of the ascent. The trail is 4,500 feet long with a 15 percent grade and takes 45 minutes to an hour to make the round trip. Once on top of the rock, the view of the Columbia River and the gorge is breathtaking. It is a quiet and yet exhilarating experience to stand on the summit with the ever-present Columbia winds sweeping around you. The trail is open year-round and is maintained by Washington State Parks. 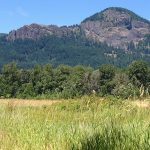 Drive west on Highway 14 towards North Bonneville, continue to Beacon Rock State Park. Parking and the rock are on the south side of the highway. You can’t miss it! Washington State Discover Pass required (available on site). 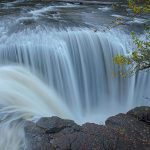 Copyright © 2019 Skamania County Chamber of Commerce.